Two of Italy's most decorated teams did battle again on Saturday night at the Juventus stadium. The pregame routine included the La Marseillaise in a show of solidarity with the victims of the attacks in Paris. There was also a standing ovation for the adored Buffon who earned his 552nd appearance for the black and white, equalling Sccirea's record. But soon enough all eyes were focused on the mouthwatering clash in Serie A. The match began in a tepid manner, with a few light challenges going in up and down the pitch, and the occasional long range shot from either side, but a slow and steady pace nonetheless. The Bianconeri held possession for the majority of the beginning of the game, occasionally feeding the ball to the electric and highly-rated Paulo Dybala, who looked dangerous from the get-go, utilising his pace to cause trouble to the shaky Milan back-line. With Morata out injured, Mario Manduzkic line-up alongside the Argentine to produce a dynamic duo of pace and strength. The midfield was a key area for both sides to establish early. Juventus looked to push up and pass the ball around, whereas Milan's target was to steal the ball in the middle of the park and hit the Old Lady on the counter attack, frequently led by Alessio Cerci. With just under half-an-hour gone, Pogba found room on the left flank, behind the full-back and cut the ball back to running Hernanes whose miss-kick left him slightly red-faced. Milan did come close shortly after, with a laser pass from Bonaventura to Cerci but the attempt left him equally embarrassed, positive signs nonetheless, from Mihaljovic's team against Juve's strong back-line despite seeing less of the ball. Coach Max Allegri was forced to bring on summer signing Alex Sandro, who replaced the Frenchman Patrice Evra after he signalled to the bench that he no longer could continue. The action and tension began to rise as the fouls began to swarm in with Sturaro and Kucka picking up yellow cards from referee P. Mazzoleni. In the 38th minute, Hernanes, playing in the 'trequartista' role showed some fancy footwork to throw Montolivo off balance, he then shifted the ball on to his left-foot but the Brazilians’ shot soared harmlessly over Donnarumma's crossbar. Hernanes continued to be a goal-threat for the home side, his free-kick which took a deflection from the wall and needed the attention of the young Donnarumma who was able to relieve the danger. Soon after, Pogba found himself, momentarily with significant space inside the Milan box, however he was unable to get his feet right and was swarmed by Red-and-Black defenders in a matter of seconds, and nothing came from it. Another free-kick chance was presented to the home side, this time Dybala whipped the ball in, but an attacking foul from a Juve player meant the chance came to nothing. The referee blew his whistle to signal halftime, with Juventus likely feeling slightly frustrated after failing to convert any of the chances that fell their way. They controlled the ball in the first half, but the play in the final 3rd was not frequent, and poor when it was, leaving them with nothing to show for their efforts as they went into the tunnel. On the other hand, Milan fans would have felt positive about the first 45 minutes. Although they didn't have a 13pt portion of possession, they created a few decent chances, with Bonaventura and Niang going close, and coach Mihajlovic must have felt confident of his side getting at least a point once the final whistle is sound. Still everything to play for. As the teams emerged for the second 45 minutes, Bonucci replaced Hernanes who often looked a step slow in the first half. This formed an experienced back line for Juventus, as Max Allegri opted to go to a three central defender system, with Sandro and Lichsteiner as the wing-backs. A penalty appeal came Milan's way just moments after the interval, but the referee ruled a foul for Niang's aerial duel with Sturaro in the box. Nervous times for the defence of Juventus who have been up there with the best in Europe for the past couple of seasons. Stephan Lichsteiner was the next player into the referee's book for a miss-timed challenge in front of the dugouts on Niang in the 50th minute. The first chance of the second half came for the visitors, the corner was struck with pace and curve, with Kucka rising and meeting the ball, his attempt was a real opportunity for his side to take the lead, but the shot failed to hit the target. It was then Juventus' turn to attack, Alex Sandro cut inside from the left and aimed for a golazo, and his shot was nothing of the sort and whistled past, not troubling the 16 year-old AC keeper. With their tails up, the Bianconeri increased their pressure, Marchisio the man, dictating the pace and tempo, passing the ball out wide for the full backs to cross the ball in, still though they were unable to create a half-decent chance, which would have give them the lead as they searched for a 6th successive win against AC Milan in Serie A.
Milan continued to soak up the pressure but were unable to muster a counter-attack or lengthy spell of possession. 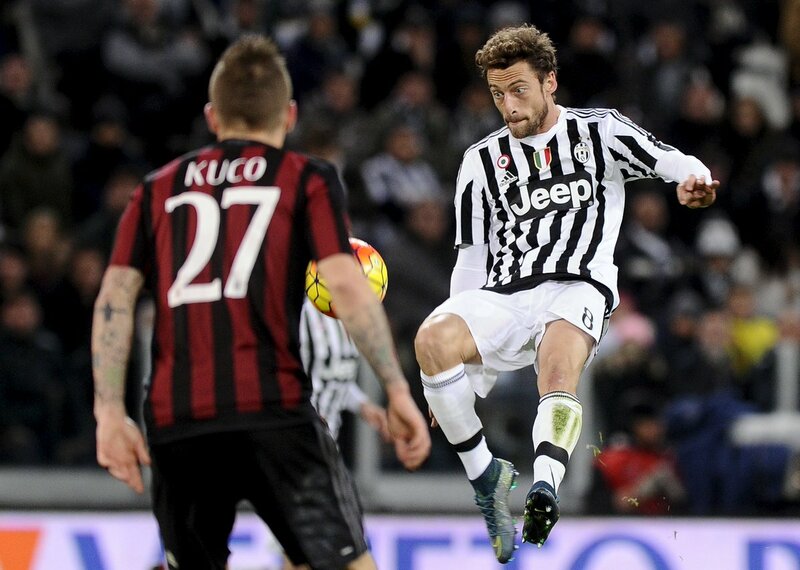 The home side began to hit their stride, pressing high up the pitch and preventing Milan from gaining any rhythm. In the 61st minute Pogba picked up the ball just after the halfway line and unleashed a belter of a shot from distance, It was a fairly easy save for Donrumma but a warning sign for Milan as they gave Pogba far too much space. Finally in the 65' the deadlock was broken. The Juventus stadium erupted at the sight of an exquisite finish from Dybala. There was great link up play from Sandro and Pogba and then Dybala, who met the ball with excellent control and converted the half-volley past the on-rushing keeper in truly marvellous fashion. The exciting young prospect has now scored six goals for Juventus this season. Following the goal, Milan were pegged back, as the confidence began to ooze out of the home side, with plenty of positive runs towards the box. A chance, however, did fall the way of Milan. Cerci made an encouraging run down the right and his ball in was connected by Kucka, but his positioning made it a difficult shot to get off, and it went over the top of the net. Milan eventually made their first change, bringing on former Shakhtar striker Luiz Adriano, with Kucka who had a solid game in midfield, making way. A goal was needed and a striker like Adriano is the perfect man for the job. The Rossoneri were not done yet, however, and with a point still in sight, they began to focus more on possession and picking out the right pass, with the occasional Juventus counter attack. The goal scorer and arguably Juventus' best player, Paulo Dybala was subbed off with just 10 minutes to go, to a standing ovation from the Black and White faithful, for his contributions today. Another member of Juventus' future, Alvaro Morata, replaced him. Shortly after, Honda came on for Niang, as Milan looked for the vital goal that would draw them level. The Japanese man has fallen out of favor for the Bosnian coach, and has been brought on as substitute in their last six matches. Juventus allowed Milan plenty of possession as the final minutes grew closer, however the Juventus back line remained resolute, and the Rosoneri were relegated to the long ball to Bacca and Adriano. The message from the touchline 3 minutes of added time, time of which Milan were unable to pose a threat to the home team. Mandzukic found a chance to seal all the game for the home side in the 92nd minute, however he scuffed his shot in a truly awful attempt. AC had one last chance as Cerci took a long range drive from 40 yards and Buffon had to reach low, his first save of the night and a late scare for those decked in Black and White at Juventus. The final whistle sounded and all three points were in the bag for the Bianconeri, who showed a mature and controlled performance on both ends of the field. Milan have much to improve on, especially on the attacking end. Juventus leap frog Milan in the table and move to sixth place as the comeback continues for the Old Lady on their quest for a historic fifth straight Scudetto. Dybala settles Juventus vs. Milan as his goal proves the differnee in Serie A.